In Psalm 139 David exalts the omnipresence of God – his everlasting love, his sovereignty over everything. This verse is often heard in hymns and gospel songs, and just about summarizes the entire concept of God‘s omnipresence – we cannot flee from God, even if we want to; we cannot be separated from God, even if other things try to make us. God is still with us, even if we cannot see him. There is nowhere we can go from God, because he is always with us – he is omnipresent. Spirit – the use of Spirit here most likely do not refer to the Holy Spirit, but God as a Spirit. Or perhaps it means the Trinity as a whole. Either way, it signifies the omnipresent quality of God – he is a Spirit, there is no physical body to limit him. The sentiment of God being spirit is rare but not unique – God is spirit, and his worshipers must worship in spirit and in truth [John 4:24]. God has the qualities of spirits – invisible, immaterial, incorruptible, uncompounded – yet he alone differs from all other spirits – he wasn’t created, but was the creator. There is no going from him, there is no escape from his righteous anger, there is no hiding place that he doesn’t own. His omnipresence is always closely related to his omnipotence – because he is everywhere, because nothing escapes him, he sees everything, and he knows everything and therefore he is all powerful. Jonah is probably the best example of someone who has attempted to flee from God, from God‘s calling, from God‘s work. Yet even as he ran away, escaped to sea, God was there [Jonah 1:3]. Even when he asked to be thrown overboard to calm the storm, God was there and sent a fish to swallow him. Some times you may be called to do work that you do not want to do. Or you may be doing the Lord’s work till a point where by it suffocates you, and you escape. In fairness, much of God‘s work isn’t easy to do – it takes a lot more love, a lot more compassion, a lot more faith and a lot more hope than worldly work. And sometimes, loving someone could be extremely hard. 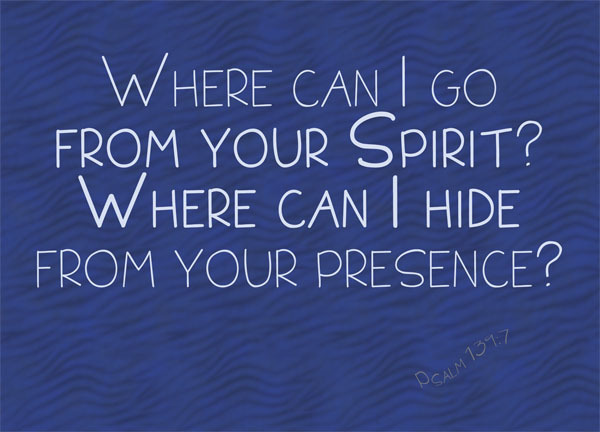 “Can anyone hide in secret places so that I cannot see him?” declares the LORD. “Do not I fill heaven and earth?” declares the LORD [Jer 23:24]. The Lord sees us, even when we hide from him, and he sees our hearts, even if we turn away from him. Sometimes we need a breather, or sometimes we don’t have enough faith to do God‘s work; not enough love to serve God‘s people. Playing Hide-and-Seek with the Lord is useless, because he has an unfair advantage in the game. He is omnipresent. Instead let us turn to him. Lift our problems up to him. And trust in his deliverance. Let us take comfort – whether we want to hide from God at times, because the laws and the expectations of a Christian life has become too tiring for us, or whether we’re facing a rough patch in life and we can’t seem to feel God‘s presence – let us take comfort, because God is omnipresent, and even if we cannot seem to see him, hear him or feel him, he is there with us. Through Christ Jesus the law of the Spirit of life has set us free from the law of sin and death [Romans 8:2] – there are many expectations in the Christian lifestyle. Loving somebody alone for example could be very, very hard. Doing the Lord’s work could be at times very challenging. But the Christian lifestyle isn’t meant to suffocate us. Let us find peace in the Lord. Be strong and courageous. Do not be afraid or terrified because of them, for the Lord your God goes with you; he will never leave you nor forsake you [Deu 31:6]. The Lord shall preserve your going out and your coming in, from this time forth, and even for ever more [Psalm 121:8|Article] – even in hard times, even in sad times, remember that our Lord is carrying us, along with our burdens, on his shoulders. He shall preserve our going out and our coming in – he is here with us. Wow! You have an amazing gift. There are so many in our world that will benefit from the explanation you have written. I understand the concepts you are working with here but I know a lot of people who don’t. Thank you for sharing. wonderful graphic and exposition. that scripture means so much to me and i guess anyone who has walked with Jesus. through Him we truly learn who God is… i pray many will at least see the graphic and feel His deep call to their soul. God bless you today! !